A road trip in Namibia is one of the greatest adventures to be had on this planet. When we arrived in Namibia for our road trip we had come with our preconceived notions, but we were not prepared. It is a land of inhospitable beauty and solitude. If you’re looking for some headspace then Namibia is where you’ll find it. Road trips in Namibia are surreal. With a population of only two million mostly living in the capital city, the 34th largest nation in the world has some desolate regions. However, despite being sparsely populated Namibia is well developed for an African Nation and can be easy to travel. It’s been described to us as “Africa for beginners,” or “Africa light,” and since we had little time to plan and it was the first country we drove through on our journey to Kenya. A journey that full of difficulties to purchase our Land Cruiser in South Africa. When we finally had the keys to Charlie, our Land Cruiser, we had three days to leave South Africa, service the truck, purchase gear, and pack all the equipment we needed to overland Africa for the next eight months. 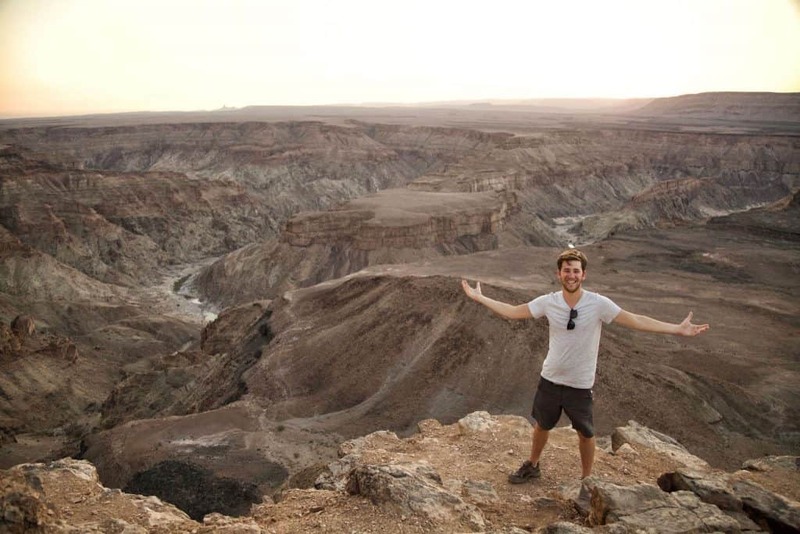 We managed to spend a month exploring the Namibia and Botswana practically had to rip us out! 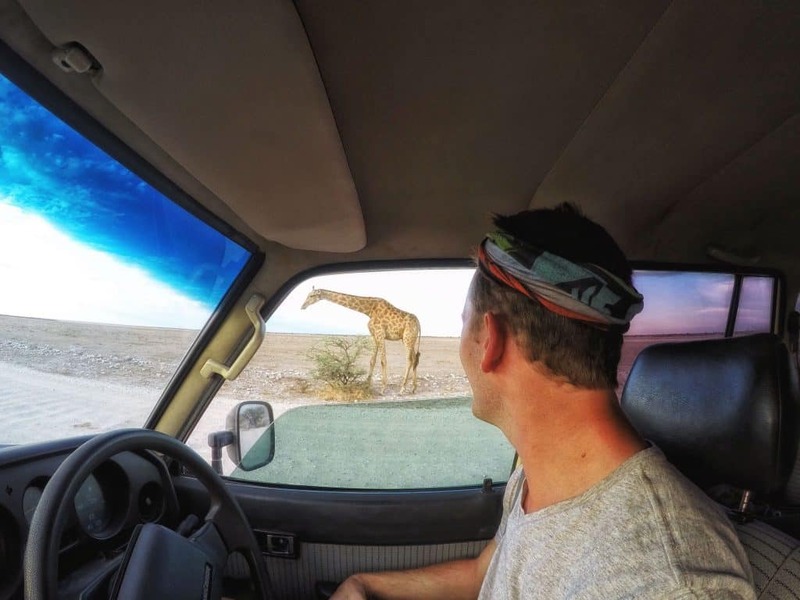 In this post, we break down what to see and where we went on in our Namibia road trip. The details aren’t official yet, but in 2019 we’re leading a tour around the highlights of Namibia. 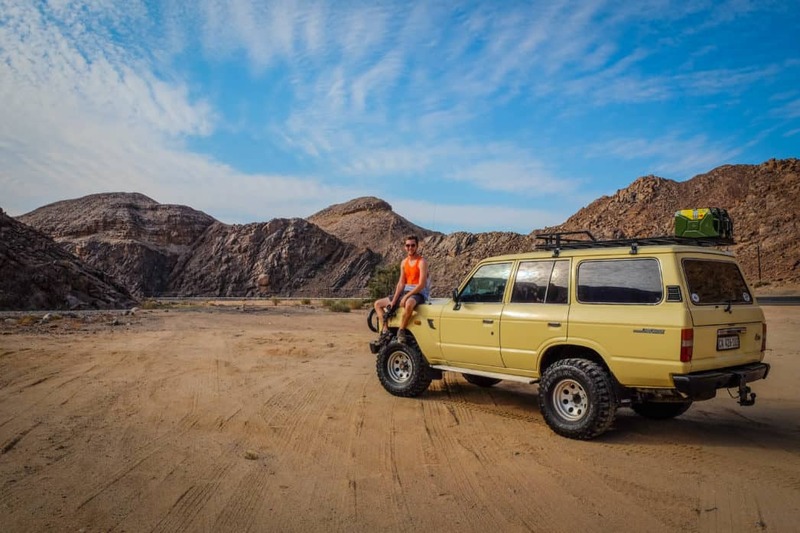 If you’ve ever wanted to explore the desert country and didn’t want to do so on your own this is a terrific opportunity to join us on a road trip in Namibia. We’ll be sure to post the announcement here once we launch all of the details, but if you want to be the first to hear about it we suggest subscribing to our newsletter. Fish River Canyon is a good starting point if you are coming from South Africa. The canyon is located about three hours from the Noordoewer border post; however, we wouldn’t cross the border late in the day. The road between the border and the canyon is desolate, turns to dirt, and has no street lights – welcome to Namibia. The canyon is the second largest canyon on earth. It costs 80 NAD for foreigners to enter the area around the canyon, but the price is well worth the impressive view. One of the best viewing points is from the Hobas viewpoint. We would recommend grabbing some cold Windhoek beers at the entrance gate and enjoy the Canyon at another viewpoint away from the crowds. It’s possible to join a hiking trip through the canyon and see the canyon from a different point of view. However, these hiking permits are only issued between May and September as the Namibian heat gets intense in the summer and flash flooding is a threat. We spent three days in the area, but if we were to do it over we think one day and two nights camping in the area is ideal. We suggest camping under the impressive Namibian night sky. Gondwana’s Canyon Road campsites are great and they have one of the only restaurants and fuel stations in the area. The NWR has campsites on offer, but they looked like a lesser value compared to the Canyon Road campsites. The second option is Ai Ais a hot spring campsite. Luderitz may be one of the strangest towns we have ever set foot in. The German town is nestled between the turbulent Atlantic Ocean and the massive sand dunes of the Namib desert. When we made it to Luderitz it didn’t even feel like we were in Africa anymore, more like another planet. German architecture, beerhouses, and street signs such as Bismark dominate the town. The vibe of the whole town is wonderfully strange, like something out of the twilight zone. The main site 10 kilometers outside of Luderitz is Kolmanskop. Kolmanskop is an old abandoned mining town that is being swallowed by the desert. 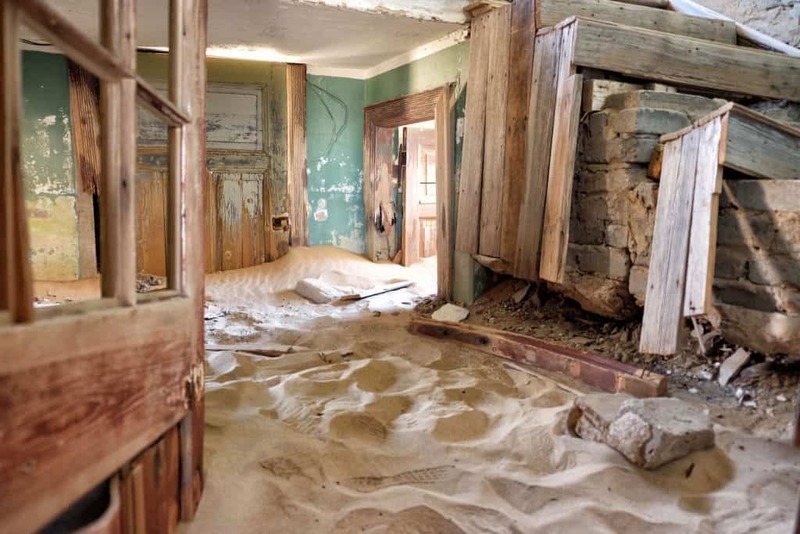 Kolmanskop rose to tourism fame when Nat Geo featured this famous photo. Ever since tourists flock to check to go snap happy at the ghost town. You need a permit to enter Kolmanskop which can be purchased at the gate day of. Permits cost 75 NAD and include a tour that runs every day at 9:30 am. The tour lasts about an hour, but we would recommend waiting a few hours till the crowds die down to get photos. On the B4 140km outside of Luderitz is the tiny mountains town of Aus. This is where you can see the last wild horses of Garub. They aren’t so wild at the moment as people are having to feed them during the drought to keep them alive. They are still incredible to see and appreciate how these horses survive in the middle of nowhere. I would recommend an Airbnb in Luderitz and grabbing some coffee and oysters at the Diaz Coffee Shop. There are a few small guesthouses and one rather harsh looking campsite. However, if you have time Luderitz is well worth a stop on your Namibia road trip. 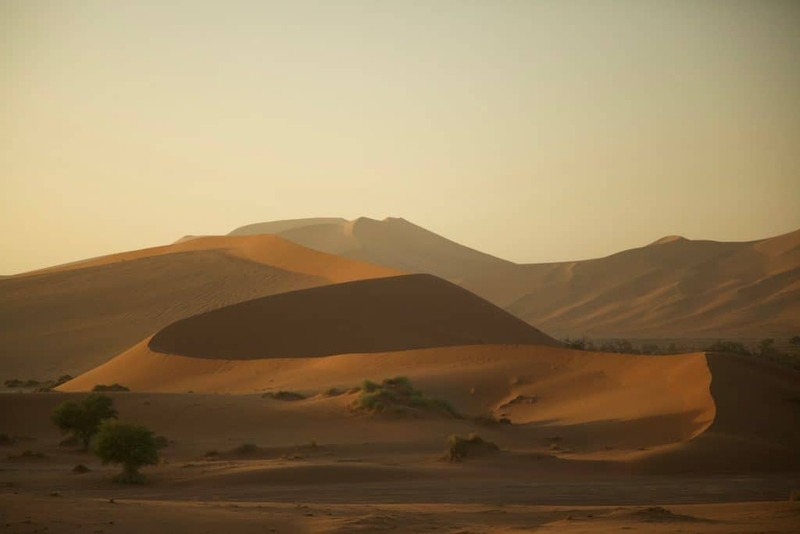 No visit to Namibia is complete without seeing the highest sand dunes in the world. A stop in Sossusvlei is on most travelers Namibian itinerary and for good reason. The red dunes are best seen in the morning light and in my opinion if you arrive anytime between 8:30 and 4:00 you are wasting your time (especially if you cherish photography). The sand gets almost too hot to walk on and depending on the season you may be sweating before you exit the car. The only way to be the first at the dunes is if you stay at the Seriesm Campsite. Guests staying inside this gate get the opportunity to head to the dunes at 5:15, and then it’s a mad dash to beat the sun. Staying outside the gates are also an option, but you will have to wait until 6:15 when the gate opens – hence missing the sunrise. Dune 45 is the highest dune in the park and is the popular place to watch the sunrise at. However, it can get crowded with overlanders so if you have your own vehicle I would venture a bit further to find a spot all to yourself. After sunrise continues on to Deadvlei. Vlei is the Afrikaans word for “marsh” and that’s exactly what Deadvlei is – a dead marsh. You will 100% need a 4×4 to get to Deadvlei, but if you don’t have one there is a spot to park and guides will take you in for a small fee. I would recommend getting to Sossusvlei at sunrise and wander around the dunes and Deadvlei for a few hours. By noon you will be ready to leave as it is HOT – trust me. The Sesriem campsite is decent, but do not let them put you in the “overflow” space. They have a full restaurant and bar there but if you want to stay cheap there is a small (and I mean small) grocery store across from the campsite. If you are on a higher budget Wolwedans is divine and a good place to relax on any Namibian road trip. Swakopmund is the ultimate destination for adventure in Namibia. You can entertain yourself with just about anything in Swakop – sandboarding, four wheelers, paragliding, or skydiving all on and over the Namib desert is great fun. Swakopmund is also one of the larger cities in Namibia so you will be able to get almost anything you need here to continue the road trip. We enjoyed hanging out, sipping coffees, and catching up with other travelers in Swakopmund. 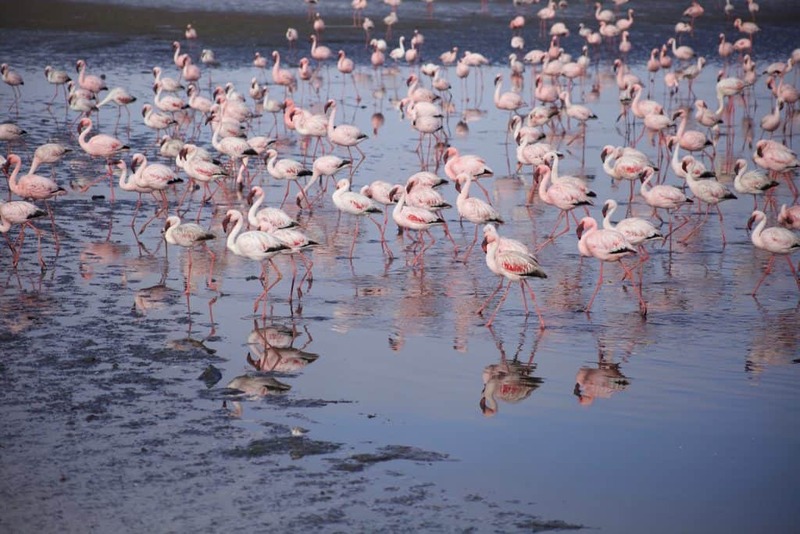 It’s also worth heading to Swakop’s sister city of Walvis Bay to see the greater and lesser flamingos. The flamingos eat, sleep, and live on the coast of Walvis Bay all year long so you’re guaranteed to get excellent sightings of the famous pink birds. I would recommend an Airbnb or stay at the Swakopmund Plaza Hotel. Don’t miss a coffee at Slowtown coffee roasters and make sure to grab a pizza at the Secret Garden Bistro. You can check out some tips and read more about getting an Airbnb coupon code here. Or just take this coupon for your first stay! If you have a fully sufficient 4×4 then a trip up the Skeleton Coast completes any itinerary. The Skeleton Coast sounds so dreary because it is. The term was coined from the unforgiving nature of the coast and the endless ships it brings to their demise. If you keep driving north from Swakopmund you will eventually get into no man’s land. The road leads all the way North to Torra Bay, but keep in mind that you are pretty much self-sufficient up here. Because of time, we drove as far north as the Cape Cross Seal Colony. We debated about burning the fuel to go to Cape Cross, but once we left we determined the experience was well worth it. 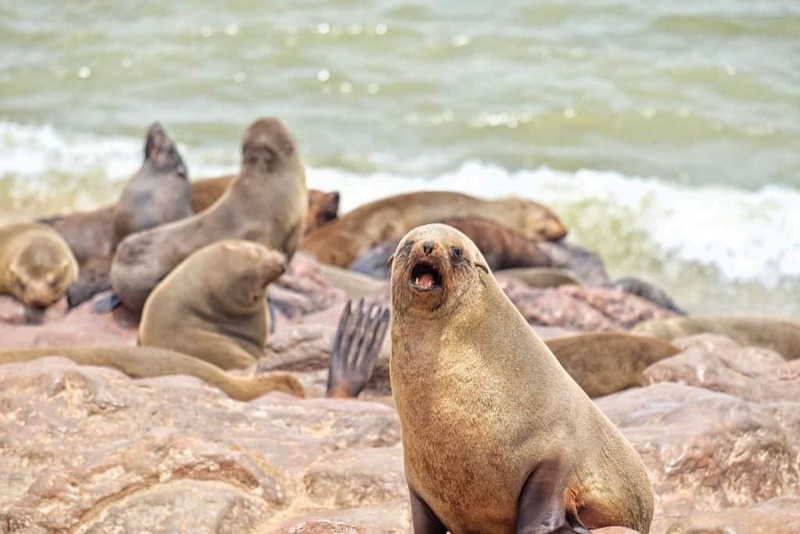 Thousands and thousands of seals call Cape Cross home and it is an impressive sight to see in Namibia. Just make sure to bring some nose plugs – it’s the smelliest place in Namibia! You’re on your own on the coast. Be fully equipped to camp, there is a campsite at Terrace Bay. We had some great days of safaris in Etosha National Park. This is easily Namibia’s best park to spot a variety of game. Etosha is easy to self-drive in any type of vehicle so we wouldn’t recommend paying for a game viewer and guide here. There are plenty of great watering holes where the animals come to drink. Almost every time we stopped at a watering hole some Lion King magic was going down. Etosha is extremely popular during school holidays and it is recommended to book accommodation in advance. Roads will get slightly more congested, but you’re still in one of the least populated countries on the planet so it won’t be anything like Kruger National Park in South Africa. 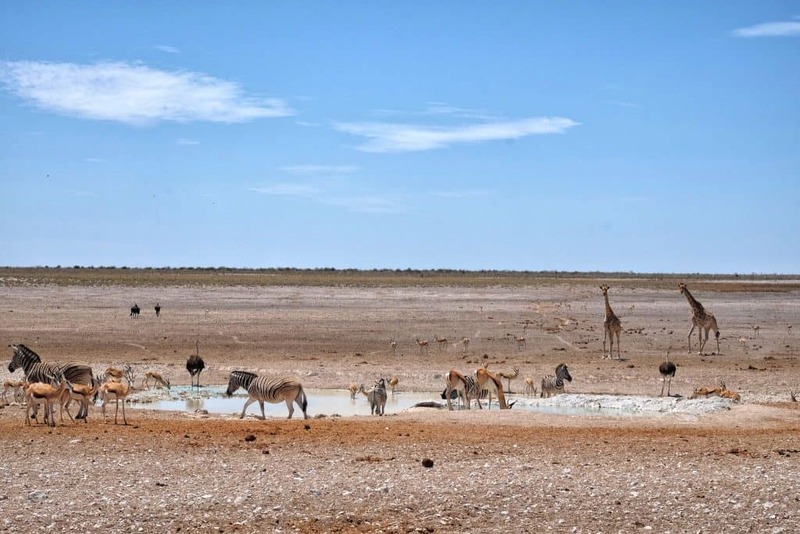 During the winter Etosha is dry, so chances of great sightings are common. We managed to see lions, hyenas, giraffe, rhino, ostriches, and just about everything else besides the elusive leopard roaming about. Perhaps, the best part of Etosha is the admission fee. It cost just 80 NAD to enter one of the best wildlife parks in the world – that’s a bargain in Africa! We would recommend staying at the Gondwana Etosha Safari Camp near the Anderson Gate or Onguma Campsite near Namutoni Gate. Both serve up fabulous food under the Namib night sky. We made our way to greener pastures after Etosha. Literally up North in the Caprivi Strip, the landscape changes drastically. Long gone is the dry desert air and endless sand that makes up so much of Namibia. The Caprivi Strip encompasses the Okavango River, Chobe River, and Zambezi River. We have to admit after three weeks in mainland Namibia it felt great to see a living tree again. We also felt like we were once again in Africa once we got to the town of Rundu and continued onward. Not only was the area green, but we found fewer Germans and Afrikaans people, instead we found people, villages, and that general lively soul that makes up so much of the continent. This was Tasha’s favorite part of Namibia. Just relaxing along the river watching the hippos and spotting the birdlife is magical in the Caprivi Strip. A popular thing to do on the Okavango is to take a houseboat out with a couple of sundowners and watch the sun light up the African sky. Hakusembe is a great lodge just outside of Rundu. Right next to the lodge is a campsite along the river. There is a swimming pool, lounge, and lastly a living museum nearby where you can learn about the local culture. You can dine here while watching Angola on the other side of the Okavango. From Rundu we made our way to the Botswana border, camping at various places and enjoying the Caprivi strip along the way. Namibia is such a great country to explore on a road trip. There are rental companies in Namibia and South Africa that specialize in equipped 4x4s designed for camping. Petrol is relevantly cheap in Namibia at 11 NAD/Liter. Other great places to visit are the northwest where the Himba live, Spitzkoppe, and Damaraland. 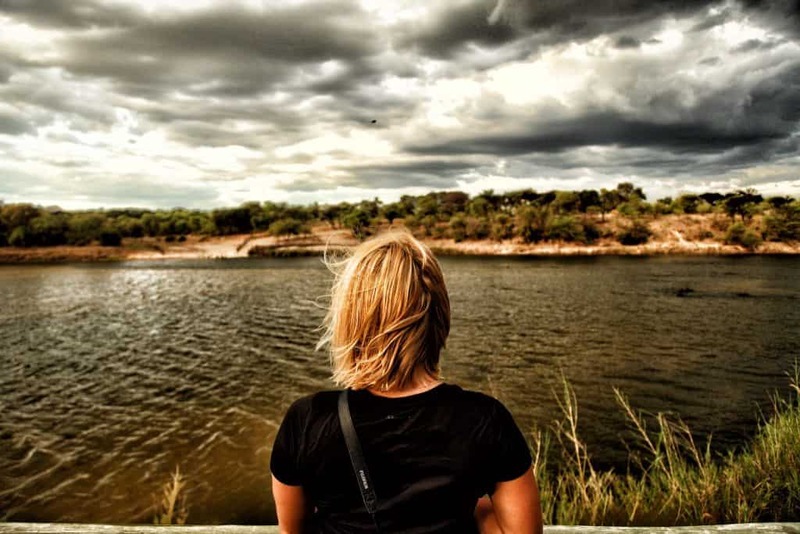 Read on for 15 travel tips to know before Namibia. Tours in Namibia: If you’re not much of a driver you can always opt for an overland tour with one of the many providers on TourRadar. TourRadar is a site that allows you to search for the best tours, compare deals, and score sweet discounts. Water: We found most of the water in Namibia fine to drink, if you want extra assurance then we love traveling with our Lifestraw Go Waterbottle. Guide Book: You’ll want to do some planning when you’re off in the bush. (Trust us, the bush doesn’t have WiFi). For those wireless nights we like planning with Lonely Planet.